AKA John Ernest Steinbeck, Jr.
American author John Steinbeck wrote moving tales of ordinary, working class Americans, works which resonated during the Great Depression, and have remained popular and pertinent over subsequent decades. His own upbringing was basically middle-class — his father was an accountant who rose to become treasurer of Monterey County, California — but his primary literary inspiration came from Sir Thomas Malory's telling of the legend of King Arthur. He worked as a ranch-hand and lab assistant to earn his tuition to Stanford, then attended the college intermittently, only taking the classes that interested him (mostly English and marine biology) and never earning a degree. After quitting college in 1925, he worked as a deckhand and construction laborer, surveyor and fruit-picker while writing his first few novels. His first novel, Cup of Gold (1929), centered on the life and romance of the pirate Henry Morgan, but like his next few efforts it was received indifferently. His fourth novel, 1935's Tortilla Flat, became a best-seller, telling a rather whimsical, humorous tale about unemployed Mexican-Americans in California, obliquely inspired by King Arthur's adventures. With his 1936 novel In Dubious Battle, focused on a strike of migratory fruit pickers on California farms, Steinbeck entered the genre of politically-charged "working stiff" fiction that became his trademark. Of Mice and Men (1937), arguably Steinbeck's most beloved work, tells the poignant story of two migrant field workers, mismatched in stature and intellect but the best of friends. His most famous work, The Grapes of Wrath (1939), was drawn from Steinbeck's extended visits to California migrant camps at the height of the Depression, and chronicles the heartbreaking exodus of homeless Oklahomans who come to California in a desperate search for work. Grapes of Wrath was adapted into a classic John Ford film starring Henry Fonda, with most of the novel's dark, stark imagery intact, but with a more optimistic Hollywood ending in place of the book's bleak finish. Steinbeck's other well-known novels include Cannery Row (1945), which deals with attempts to repair a fractured friendship among workers and shopkeepers in a California cannery town, and East of Eden (1952), a sprawling but intriguing soap opera of blackmail and murder, inspired the Biblical sibling rivalry of Cain and Abel. His lesser-known but still excellent writings include The Wayward Bus (1947), a compact, intense tale of passengers stranded at a gas station, and Travels with Charley (1962), a non-fiction work which chronicles Steinbeck's journey across America with his pet poodle. He also wrote the original story for Alfred Hitchcock's Lifeboat, and the screenplay for Elia Kazan's Viva Zapata!, a film biography of Emiliano Zapata starring Marlon Brando. 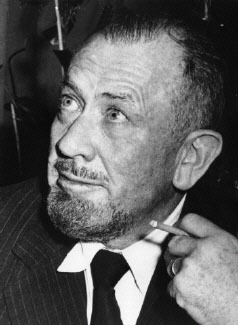 Steinbeck won a Pulitzer Prize in 1940 for The Grapes of Wrath, and was awarded the Nobel Prize for Literature in 1962. His third wife, Elaine Anderson Scott, was the ex-wife of actor Zachary Scott.